Originally published under the title "Sadat's Visit." Egyptian President Anwar Sadat's November 20, 1977 visit to Jerusalem was the most important single political event in the history of the Arab-Israeli conflict. 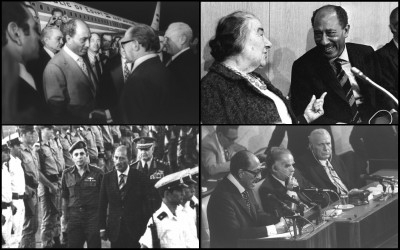 Forty years ago this month, Egyptian President Anwar Sadat landed at Ben-Gurion airport for a two-day visit in Jerusalem at the official invitation of Prime Minister Menachem Begin. The entire world held its breath. Here was the leader of the largest and most populous Arab state, which had spearheaded repeated pan-Arab attempts to destroy Israel, visiting the contested capital of the Arab world's foremost nemesis in an apparent acquiescence to the legitimacy of the Jewish state's existence and its right to peaceful coexistence with its Arab neighbors. A recent survey held by Bar-Ilan University's Begin-Sadat Center for Strategic Studies (BESA ) and the Foreign Ministry shows a rather mixed picture. While 81% of respondents viewed the agreement as conducive to Israel's national security, 51% deemed the concessions made for its attainment (notably the evacuation of the oil-rich Sinai Peninsula and the demolition of Yamit) to have been excessive, compared to 46% of respondents who considered them commensurate with the agreement's mammoth gains. Peace with Israel was the price Cairo had to pay for US economic and military aid. This apparent contradiction seems to be a corollary to Israelis' keen awareness of Mubarak's lukewarm perception of peace. While one can only speculate about Sadat's own ultimate intentions – he was assassinated in October 1981 by an Islamist zealot – for Mubarak, peace was of no value in and of itself but was rather the price Cairo had to pay for such substantial benefits as US economic and military aid. As a result, Mubarak reduced interaction with Israel to the lowest possible level, while simultaneously transforming the Egyptian army into a formidable modern force and fostering a culture of virulent antisemitism in Egypt, a culture whose premises he himself evidently shared. Though President Abdel Fattah Sisi has taken a different route, bringing Israeli-Egyptian relations to unprecedented heights, most Israelis seem to acknowledge the instrumental nature of the Egyptian perception of peace. Consequently, only 14% of the BESA /FMA survey respondents regarded Egypt's attitude to Israel as friendly (of whom 37% thought Israel "overpaid" for the agreement), while 68% viewed it as lukewarm and another 18% as hostile (of whom 44% and 68% percent respectively deemed the concessions made for the agreement excessive). Most Israelis seem to acknowledge the instrumental nature of the Egyptian perception of peace. Not surprisingly, perhaps, support for the agreement was found to be strongest among center-left voters, though it was actually the right-wing Likud Party that made this historic breakthrough. Ninety-two percent of Zionist Union and Yesh Atid voters, as well as 88% of Meretz voters, believed the agreement to have enhanced Israel's national security as opposed to 82% of Likud voters, 82% of Bayit Yehudi's voters and 67% of Yisrael Beytenu voters. Support for the agreement within the ultra-Orthodox community was even lower, with a mere 64% of Shas voters and 68% of United Torah Judaism voters viewing the agreement as conducive to Israel's national security. Likewise, the survey exposed the ambiguous attitude of Israel's Arab citizens to the agreement, or indeed to possible Israeli reconciliation with the neighboring Arab states. While only 68% of Israeli Arabs viewed the agreement as conducive to Israel's national security, compared to 83% of their Jewish compatriots, 17% of them deemed the price paid for its attainment to have been too low (compared to 1% of Israeli Jews). In other words, Israeli Arabs are more inclined than their Jewish counterparts (with the salient exception of Meretz voters) to have their state pay a higher price for a less favorable international agreement affecting its national security. This inclination is markedly higher among voters for the Joint Arab List (compared to those voting for Jewish parties) with 22% of them considering the price too low. This gap between Israeli Arabs and Jews notwithstanding, both communities are equally skeptical about the prospects for a Palestinian-Israeli peace agreement, with over 80% of respondents agreeing there are currently no leaders of Sadat's and Begin's stature on either side of the divide who are capable of effecting a similarly momentous breakthrough. Hardly a heart-warming prognosis after nearly four decades of Egyptian-Israeli peace.